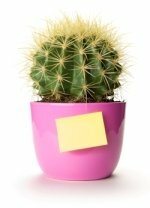 Well-chosen office plants can instantly enhance your corner of the corporate world. Put a couple lush, leafy accents on your desk and you'll create an instant gardenlike ambience. The natural beauty of plants is soothing and can even brighten your spirits. Want more? 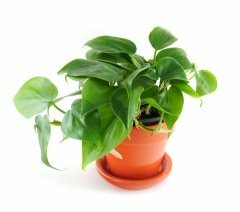 Many common indoor office plants clean the air, removing air pollutants caused by chemicals in furniture, paint and carpeting. And you can breathe easier knowing they do a good job of recycling the carbon dioxide that we exhale into oxygen. Yes, plants are good for you. Just think...for the cost of a mocha latte or two, you can treat yourself to a fresh, long-lasting accent that'll give your mood a lift every day. And don't you deserve it? I pulled together a few easy-care plants that make good candidates for sharing your office space. 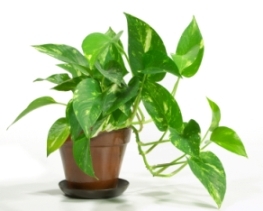 Heartleaf Philodendron won't help you climb the corporate ladder, but it will be there with you all the way. Hardy and long-lasting, this sweetheart-of-a-plant doesn't need coddling, either. It thrives under fluorescent lights and tolerates neglect like few plants can. It'll take just about any challenges you can dish out and you'll never see it suffer. Pothos a.k.a. Devil's Ivy is one of the easiest plants you'll ever grow. It tolerates low light, low humidity, and dry soil (at least for a while). Its handsomely marbled, long-trailing vines make pothos ideal for a shelf or the top of the filing cabinet. A bit aggressive, pothos may take over the office if you don't watch it. Cut it back once in a while to keep it under control. This is one of nature's best indoor air purifiers. And it couldn't be more adaptable to life at the office. 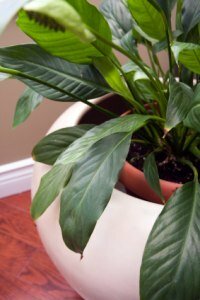 Peace Lily is tolerant of low light, as well as dry air that's typical of office buildings. Although easy-going, give it a little nurturing, and it will pay big dividends. Consistently moist soil and bright fluorescent lights will help it bloom. They make great office plants. Hard working, and never complain. What more could you ask? Owwww! You'll want to be careful where you place a Cactus. Your hands can get pricked -- and its spines can easily be damaged -- if it's in a spot where it might get bumped or knocked over. Cacti grow best in a sunny window. However, I've had one on my desk under fluorescent lights and it did just fine. Drought-tolerant, this is one plant you don't have to worry about watering while you're on vacation. Dracaena hardly needs an introduction. It's a long-time resident in our homes, but it makes a welcome work buddy, too. Young plants are easy to fit on a windowsill. Dracaena also thrives under fluorescent lights. If you're a forgetful waterer, this one is for you. It won't easily wilt and make a bad impression. 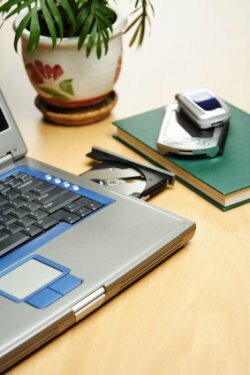 Want instant success? You don't need luck with this easy-care plant. 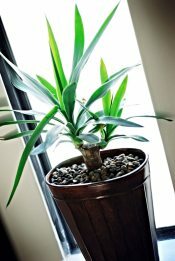 Dracaena sanderiana will grow in a vase of water with stones for support. 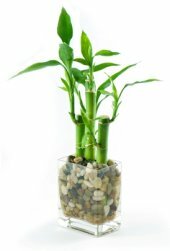 Lucky Bamboo is popping up on desks in offices everywhere...and for good reason. It's bold. Dependable. And it has a well-deserved reputation for being flexible. Sometimes its stalks are braided and twisted into all kinds of shapes. And that's not all...feng shui enthusiasts believe this plant brings good luck and fortune. I just think it looks cool.